Date: Saturday, 25 October. Venue: Tynecastle Stadium, Edinburgh. Kick-off: 17:30 BST. Coverage: Watch on BBC ALBA, listen on BBC Radio Scotland 810MW/DAB/online; live text commentary on BBC Sport website. Consistency has been the key to Scotland reaching the 2015 World Cup play-offs, according to former national captain Julie Fleeting. The attacker has been impressed with the discipline Anna Signeul's crop, who face the Netherlands in the semi-final first leg on Saturday, have shown. And she insists they have now hit their peak. "Scotland have had a fantastic campaign," Fleeting told BBC Scotland. "In the last few campaigns they tended to drop points where they possibly should've been winning them, but it's been a totally different story this time around. "It just goes to show the class they have throughout the squad. They've stayed consistent and the only team able to take points from them has been Sweden. "They're not a team of individuals; obviously they've got [Seattle Reign's] Kim Little, who's had a fantastic season over in America, but their strength is they've got players throughout who are playing professionally at the moment and who, over the last two or three years, have really stepped up. "They can rely on everybody to come up with goals, create chances and definitely stop goals going in at the other end." The Scots were narrowly pipped to an automatic place at the Canada showpiece by Pia Sundhage's Swedes, and they face a tough task to make it there through the play-offs. First up is a double-header against Roger Reijners' Dutch side, before the winner faces either Italy or Ukraine for the right to claim a place in next year's finals. Reijners' team are ranked 15th in the world and Fleeting knows the challenge awaiting her compatriots. "They're always very organised," she said. "They're disciplined; they all know their jobs and what they want to do. The players tend to be athletes - usually quick on the wings - and are just a very good team." Having earned more than 100 caps since making her debut at 15 years old in 1996, Fleeting has witnessed Scotland go through many transitions and is adamant they have never been in a better position to reach their first finals. "I think it's definitely their year," she predicted. "They've come very close in recent years but probably didn't have as strong a squad, so now really is their chance. "Everybody can feel it. 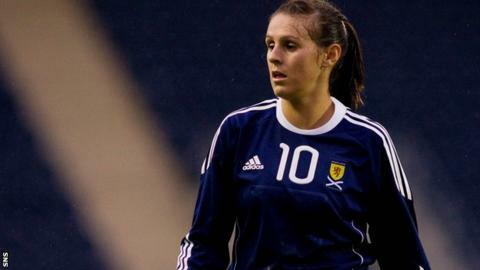 All the people who are attached to women's football in Scotland can see how close they are, how much everyone wants it and how hard they're working to get there." The 33-year-old, who currently plays for Celtic, is one of the most recognisable names in women's football thanks to her glittering career. From skippering Ayr United to turning professional with San Diego Spirit and then spending eight years at Arsenal Ladies, during which she helped them become a formidable force domestically and in Europe, Fleeting has tasted much success. "I'm very proud to have captained my country," she explained. "Unfortunately, I haven't been able to play in a finals but reaching 100 caps and 100 goals was a special time. "In club football, the pinnacle would be winning the Uefa Women's Cup with Arsenal. I'm very fortunate to have had so many highs and football has been such a fantastic part of my life for so long." And Fleeting believes the Scottish set-up could learn from how the game is run in the United States, where she enjoyed a year with Sprint. "Any country in the world would love their sport to be what it is there," Fleeting said. "It's a different culture, and Scotland could, I'm sure, take from that but as a small country we're working really hard to improve. "I think you can see, with the players that are coming through and the amount of girls that are playing now, the massive difference made in the last few years." Fleeting has done just about everything as a player and has the medals to prove it, so could she look towards nurturing the next generation of talent when she hangs up her boots? "I don't know whether, when I finish playing, I'll look to get in to coaching," she added. "But I missed it when I took time out, so who knows?"